A utility to convert CD-ROM to ISO BIN Image file format(s), and has the option to extract/edit ISO BIN Image file directly and also an ISO BIN Converter to Convert BIN to ISO ! 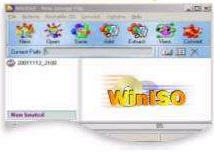 ISO BIN Converter - WinISO is a CD-ROM image file utility that can convert BIN to ISO Image, extract/edit/create ISO Image files directly, make bootable CDs and as a ISO BIN Cconverter Extractor Editor. It can process almost all CD-ROM image file(s) including ISO Image and BIN Image. With WinISO, you can add/delete/rename/extract file(s) within image files. You can convert image files to the standard ISO format and you have the ability to create ISO BIN image file(s) from a CD-ROM. The operating system requirements are Windows 95, Windows 98/98SE, Windows Me, Windows NT4, Windows 2000 or Windows XP. Process almost all CD-ROM image file(s) including ISO BIN imgae files. Ability to add/delete/rename/extract file(s) within image files and Convert image files to the standard ISO format . WinISO is the first software to edit ISO BIN and almost all image file(s) directly! You can convert almost all image file formats, including BIN, and save it as a standard ISO format file. Supports almost all known CD-ROM image files, including some virtual CD- ROM container files.